How vulnerable your Fuchsias are in the winter depends on which varieties you have and which part of the world you live in. Here, in central England, some of the more hardy varieties will survive outdoors but the majority need the modest protection of a cold (unheated) greenhouse or a similar frost-free environment. This short article describes the method I use to prepare my Fuchsia's for the winter and the protection I give them. 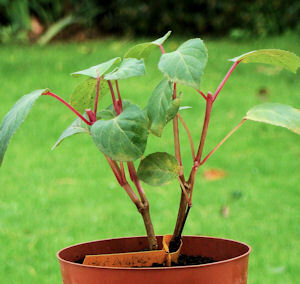 Obviously, the process starts by lifting the plant and potting it into a suitably sized container. I find most of mine will fit quite snugly into a 5-inch plastic pot. During the winter the plants will drop their remaining flowers and their leaves. If left around the base of the plant or on the greenhouse bench, the dead material will soon begin to rot and become diseased. One approach is to maintain a very regular housekeeping regime and to pick up the dead material as it falls. Another approach, and the way I favour, is to remove all such material at the outset, and then there's nothing else to do later. It can be hard when a plant is adorned with beautiful flowers but to leave them to fall and then not to clear them away, is most definitely not recommended. So, with the plant safely bedded into it's new pot (Fig.1), the next step is to remove all unwanted material. This includes long stems and mishappen branches. I try to prune each plant back to the circumference of the pot and to achieve an overall 'roundish' shape. Obviously, there are no hard and fast rules as to what each Fuchsia should look like when cut back as some grow upright and some trail, but the aim is to achieve a tight, compact balanced framework for next years growth. 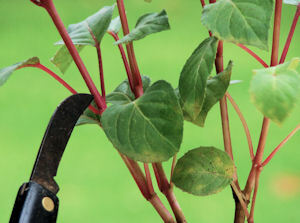 Make each pruning cut just above a leaf node, for the same reason that we take cuttings from just below the leaf node, because that's were new growth starts from. In the spring, a pair of leaves will form at each leaf node and soon give us a nice bushy plant. For the purposes of the pictures I have used an open upright plant that shows it's structure clearly, but the principle applies equally well to Fuchsia's of any shape and size. On each stem, locate a suitable leaf node and prune just above it (Fig.2). If in doubt about the place you're thinking of cutting, then go up one node and cut there. You can always remove another piece later if the plant is looking unbalanced. When a nice shape has been achieved (Fig.3), remove any remaining leaves from the plant. Once the bare skeleton of the plant can be seen (Fig. 4), you may see a few places where an extra snip here or there will improve the balance of the shape. Don't be afraid to take that bit extra if you think it needs it, but always cut just above a node. One of the big questions is "When?". This is going to depend very much on your own local climate. An occassional light frost isn't a killer, but we really need to aim at avoiding prolonged cold weather. For me, early to mid October is about right. Although all except the most tender would tollerate temperatures until late October, early November, it really isn't worth taking the risk. Regrettably, many plants will still be in full flower at this time, and this makes it especially hard to cut them back. For this reason I tend to tackle the process in two stages. First I lift the plants, put them in pots and move them into my greenhouse where I can continue to enjoy their colourful flowers for a few more weeks. Later, as the flowers drop, I do the pruning. Although I've used a small open plant for the purposes of illustration, as you will see in the sequence of photo's in Fig 5, the same method is used for plants of any size. OK ... so you've butchered your lovely plants, but they will thank you for it in the spring and reward you with bushier, healthier growth that once again has a nice rounded shape. 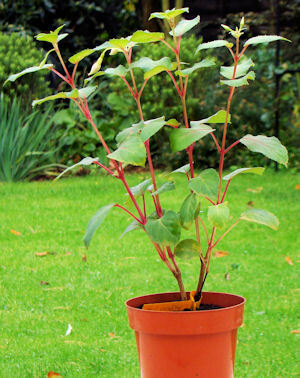 And in the spring, remember to pinch out the new growth often to develop a really compact dense plant. 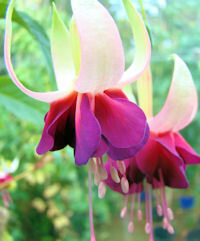 (see my Fuchsia care tips). A question I often get is with regards to watering. I find they need very little water over the winter. I give them enough to keep the soil moist, but never 'wet'. 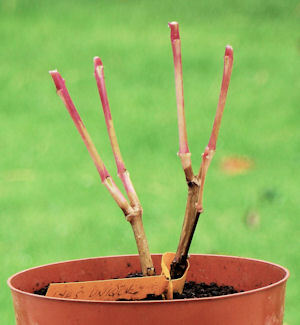 At the first signs of new growth in the spring, restart your normal watering regime to encourage them out of hibernation.